CCA Kids Blog: Is the Reflo Smart Cup Is Right For You? We have a new product resource to share with you. 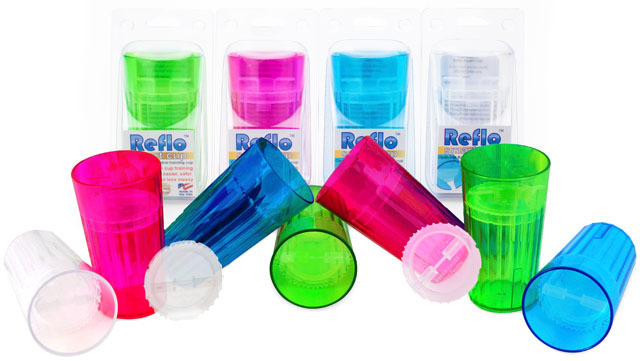 If you are looking for the right cup for your child, check out the Reflo Smart cup. Reflo has generously offered CCA a starter pack of cups to distribute in our care packages and we couldn't be more excited for our families to try them out! The Reflo Smart Cup is designed with an insert that goes inside the cup to slow the flow of water or juice. It dispenses exactly where the cup meets the lips. There is no need for suction with this training cup, so it is perfect for kids with craniofacial differences. Gravity does all the work! And it looks just like the cups the big kids use. You can check out this video they shared with us and find out more.